Documentation from Duane Linklater’s artist talk and conversation with Director of Exhibitions and Programs Georgina Jackson. 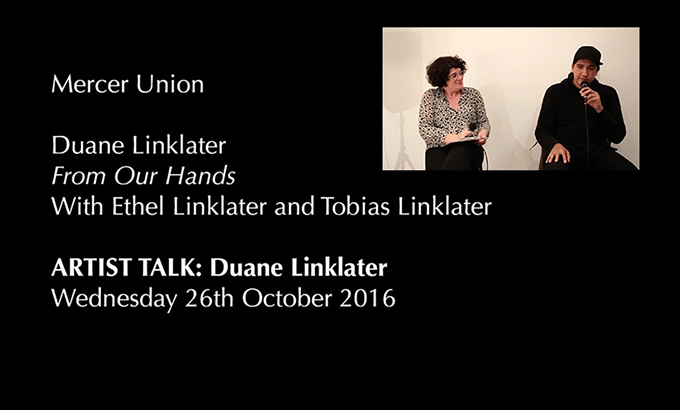 The talk was held in conjunction with Linklater’s exhibition From Our Hands, presented at the gallery from September 9 to November 5, 2016. Mercer Union is delighted to present a solo exhibition by Duane Linklater titled From Our Hands, with Ethel Linklater (Trapper) and Tobias Linklater. Working across installation, performance, film, and photography, Duane Linklater excavates histories to unearth folds and knots addressing cultural loss, recovery and sovereignty. Unearthing work hidden beneath gallery walls or re-inserting iconic Indigenous imagery inscribed within Canadian identity, he explores the migration and exchange of knowledge and ideas, and their consequences. Duane Linklater is Omaskêko Cree from Moose Cree First Nation in Northern Ontario. Born in 1976, he holds bachelor’s degrees in fine art and Native studies from the University of Alberta (2005) and a master’s degree in film and video from the Milton Avery Graduate School of Arts at Bard College (2012). His work is currently on exhibition in a two-person exhibition Parallel Excavations (w/Tanya Lukin Linklater) at the Art Gallery of Alberta, Edmonton, Alberta and he is participating in the SeMa Biennale 2016 in Seoul Korea. Recent solo exhibitions include; Salt 11: Duane Linklater, Utah Museum of Fine Arts, Salt Lake City (2015); ICA@50: It means it’s raining, ICA, Philadelphia (2014); Decom­mi­sion, Maclaren Art Cen­tre, Bar­rie, Ontario; Learn­ing, Susan Hobbs Gallery, Toronto; Some­thing about encounter, Thun­der Bay Art Gallery, Ontario; Grain(s), in col­lab­o­ra­tion with Tanya Lukin Lin­klater, Images Fes­ti­val co pre­sen­ta­tion with Museum of Con­tem­po­rary Cana­dian Art, Toronto; and Sec­ondary Expla­na­tion, The New Gallery, Cal­gary (all 2013). Linklater was awarded the Sobey Art Award in 2013. Duane is represented by Catriona Jeffries Gallery Vancouver. He lives with his family in North Bay, Ontario. This is Linklater’s first solo institutional exhibition in Toronto and is the third in a series of commissioned solo exhibitions at Mercer Union generously supported by Partners In Art.